My background has been rich in the conservation and restoration of many historical artefacts mostly on paper and parchment, books and paintings and in the service of the most prestigious of clients. But rarely have I encountered wax seals, those mostly little red things hanging from the bottom of documents, so my introduction to them four years ago by the gracious Librarian & Archivist, Dr Clare Rider at St George’s Chapel Archives was met with not a little apprehension. 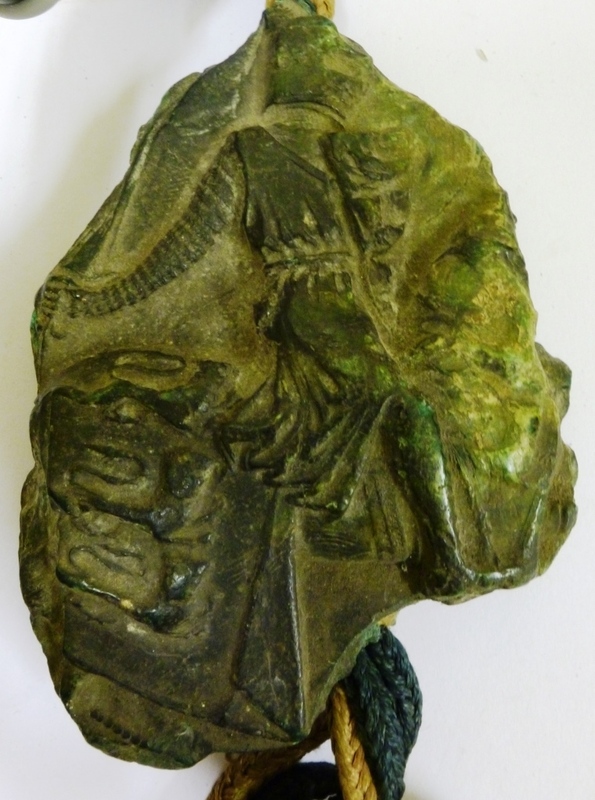 Since then I have offered my voluntary service on Tuesdays to help clean, repair, survey and protect some 2,000 plus fascinating medieval wax seals. When I relate what I have been up to for the past four years to some of my family and all of my friends I am met with a glazing-of-the-eyes and pathetic attempts to suppress their yawns. I have morphed into, not a Navy Seal, but a Geek Seal and very proud of it I am too! So let me try to explain what treasures we have at St George’s Chapel Archives and to begin with a short background to the subject. A seal attached to a legal document is a device for authenticating the document. It may be attached by a tag (a strip of parchment threaded through slits made in the folded foot of the document) a tongue (a strip cut laterally across the foot of the document with the seal attached at the end) or a cord (made from wool, silk and often plaited, threaded through the foot of the document) or applied directly onto the document. Most early seals are made of coloured beeswax, although some are left uncoloured and they generally have an impression stamped into them, though again, some are just wax blobs. The impression is created by a hand-engraved matrix or die, which in principle is the personal property of its user, i.e. the person accepting responsibility for what the document says. In England prior to the early 11th century the solemn grants of lands and rights bore no seal and their authority was written and signed by eminent witnesses along with the sign of the cross for sacred and divine significance. The earliest English documents known to be authenticated by attached seals are the writs of Edward the Confessor (1042-66). 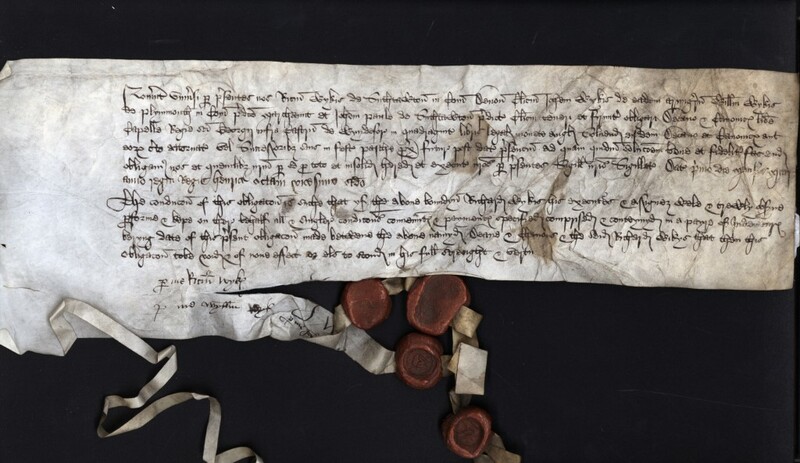 This is possibly the period when wax or metal seals were introduced as a permanent form of document authentication in England. 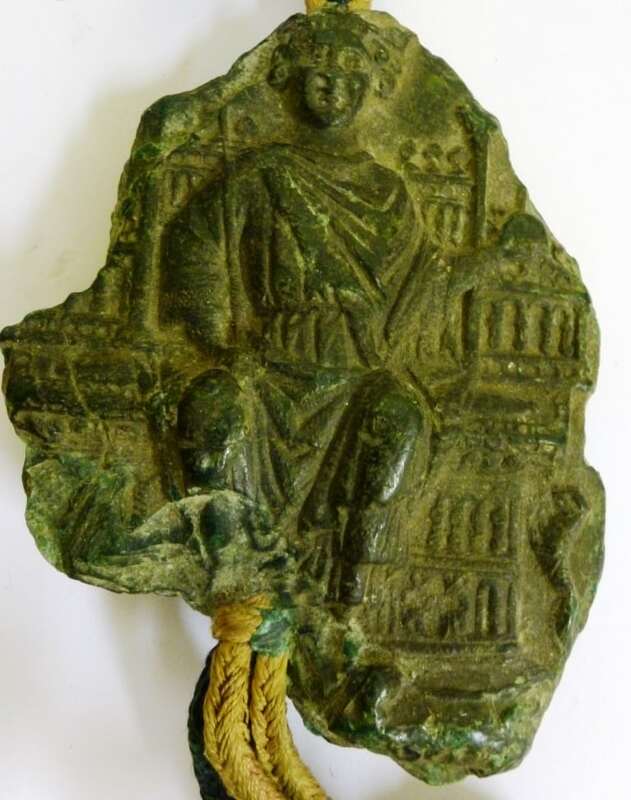 Whilst there are many thousands of medieval wax seals, some broken but many intact, within the archives of British libraries and institutions there are sadly very few of the matrices remaining. This is a pity because the study of the subject is enhanced if a well impressed seal has its matching ‘partner’ complete, like two hands coming together in prayer. Nevertheless, the real importance is the document together with its attached seal. The matrix would have been engraved and made by hand, some of the best were done by gold or silversmiths, and the materials used were copper alloy, gilt or silver and most had a handle made of metal or wood which would be held and pressed into the soft wax. Some smaller seals were made of precious metals in the form of a signet ring. My four years of experience at St George’s Chapel Archives has enabled me to experience all of these categories, but the overriding majority of seals here are personal seals, belonging to the seal owning public. The great spread of personal seals in the 12th/13th centuries and after reached out to virtually all landholders, from the largest to the smallest. It seems that virtually no one, including villeins, such as tenant farmers, was denied the use of a seal to authenticate a legal document – either their own or a borrowed seal. Therefore the plethora and complexity of designs and motifs impressed into the wax for us to study today is astounding. 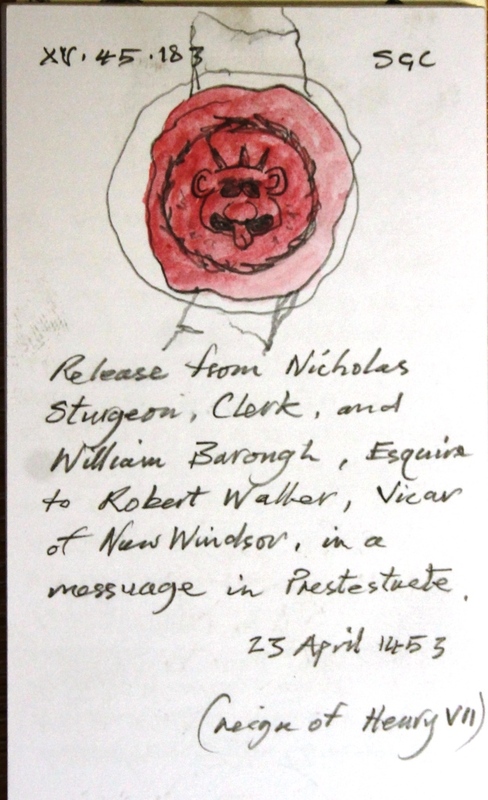 The collection of personal seals at St George’s Chapel Archives is no exception. A seal depicting a grotesque head. Sketch by Peter Eley. 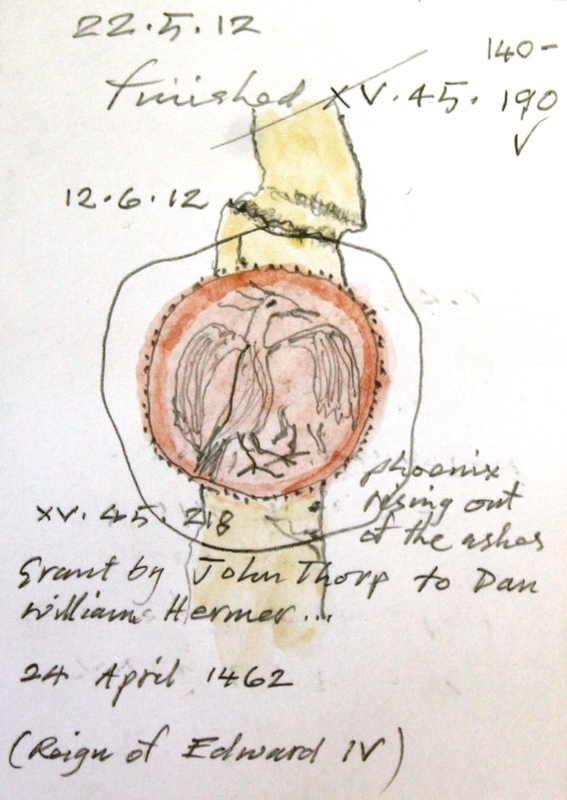 A seal depicting a phoenix rising from the ashes. Sketch by Peter Eley. 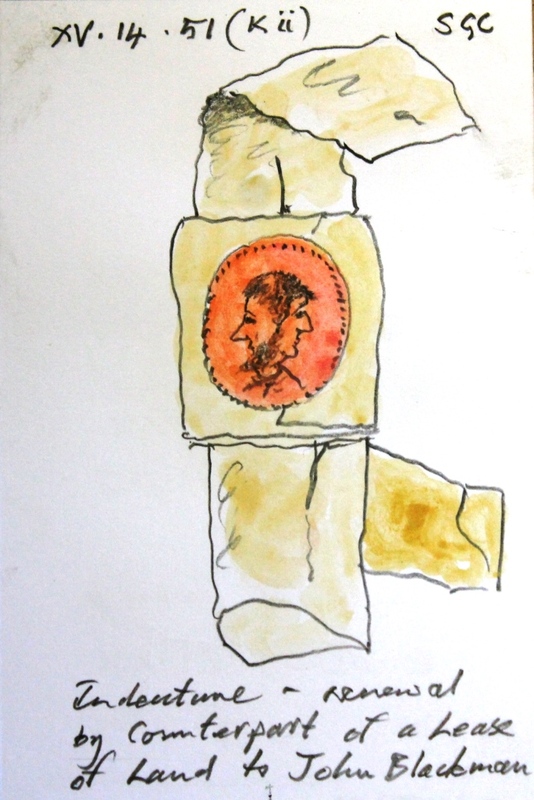 A seal depicting a two-faced man. Sketch by Peter Eley.